I have a Patreon here and I would love to have your support! You get to see cool extra drawings and doodles, heck you could even be in the comic like everyone in this strip here! Please and thank you! So, I don’t fully understand the thought process behind the change of Manager On Duty (MOD) to Sales Leader. It doesn’t denote responsibility like the title Manager would, and if you’ve seen managers on the sales floor, they’re more directors of sales. They get the bookseller to the cash register, they answer calls to figure out issues, the open locked doors for deliveries, they handle difficult customers. What I’m getting at is that they don’t ring up transactions on a register to make a sale all that often. Paging for a manager is just something everyone does and understands in a retail environment. If a customer comes up and asks to see a manager, you know what they want. No customer out there is going to ask for a Sales Leader. I’m scratching my head and what the justification could be to have someone who has higher responsibilities than a regular employee be called a Sales Leader. It seems like a demotion to me. Manager has been ingrained in our minds to mean responsibility, decision making, authority. 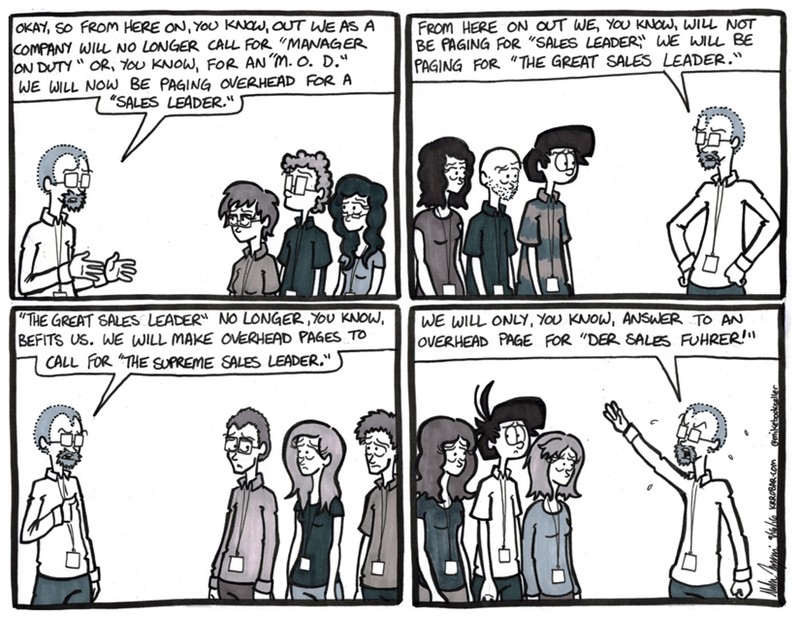 Sales Leader says… Sales? The lead sales? If I’m in a management position at the Bookstore and I’m filling out a resume for a job, Sales Leader is much less impressive than Manager. Manager says you can run things, Sales Leader, to me, says all you know is how to be good at sales. Managing out on the floor is much more than that. And what of those managers who work in the stockroom or in the Cafe? Stock Leader? Cafe Leader? The whole thing smells like it was thought up by a Home Office Desk Monkey justifying their substantial paycheck.